Why zip flying tour most popular tourist activities in Nepal? Zip flying tour in Nepal is one of most updated adventure attractive for tourist in Nepal Himalayas. Zip flying tour attracts travelers with different opportunities for adventure sports. The Zip-flyer that starts from the 5,330 ft from Sarangkot hill station and ends at 3,150 ft in Hemmja village. 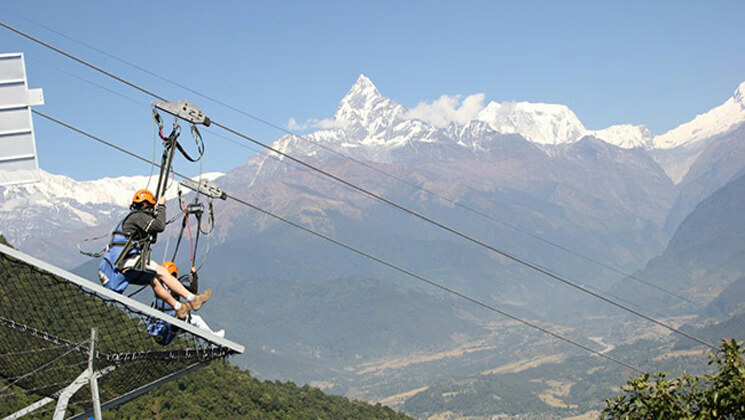 An adventure zip flyer trip in Pokhara is the longest one in the world which is 1860 meters long. Alaska US has Zip flyer but which is 1600mtrs long only. The Zip flyer is very amazing adventure for the tourist they can easily view Annapurna mountain range, Mt. Fishtail (6,997m), Dhaulagiri range (including Dhaulagiri fist 8167 meters, Lamjung mountains (6,986m) and Panoramic view of Pokhara valley and tourist feel flying in to the air which runs 140km/per hour speed. Zip flyer is Comfortable and installed the best technology for its authenticity, strength, and durability. The Annapurna region trek is located in the central but western part from Pokhara, The second largest touristic hub of Nepal. Pokhara is a paradise of beautiful mountain’s scenery and pristine lakes. There is some hill station which is also equally popular for hiking together on your trip with zip flying tour. Besides that, you can the Annapurna massive including Dhaulagiri and Manaslu mountains which are above 8,000 meters above sea level. The best time to visit zip flying with Annapurna trek is either on Spring (March to May) or Autumn (October to December) in this time weather is very clear. So you can see the pristine Himalayas and beautiful landscapes. Take a review about Annapurna Trek combine with zip flying tour in Tripadvisor.